I read this article and found it very interesting, thought it might be something for you. The article is called Tibetan Language Rights Advocate Tashi Wangchuk’s Trial Ends Without a Verdict and is located at https://tibet.net/2018/01/tibetan-language-rights-advocate-tashi-wangchuks-trial-ends-without-a-verdict/. 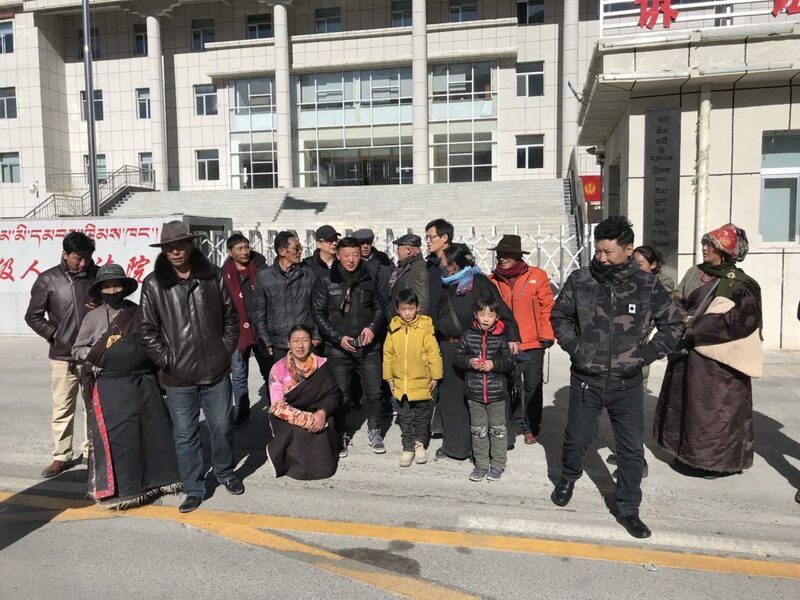 Tashi Wangchuk’s family members outside the Yushu Intermediate People’s Court in Qinghai province. DHARAMSHALA: The highly anticipated trial of Tibetan language rights advocate Tashi Wangchuk has ended without a verdict today. Tashi Wangchuk was put on trial for allegedly ‘inciting separatism’ at the Yushu Intermediate People’s Court in Qinghai Province. The trial, which lasted for about four hours from 9:30 AM to 01:30 PM, was adjourned with no final verdict by the judge. It is still possible that a verdict and sentence may be announced sometime later. During the trial, the prosecution has shown a New York Times video in which Tashi Wangchuk can be seen advocating the rights of Tibetans to learn and study their mother tongue. The video also details his attempts in Beijing to sue Yushu government officials for sidelining Tibetan language in schools. “The New York Times video ‘A Tibetan’s Journey to Justice’ was projected as the major evidence,” Liang Xiaojun, Tashi Wangchuk’s lawyer said via Twitter. “Other related evidence was also shown. The prosecution, the defense and Tashi Wangchuk himself have all expressed their points of view. Tashi’s expression was very clear and his views were concise,” he added in the tweet. According to reports, the prosecution also tried to prove that Tashi Wangchuk smeared Chinese government’s policy on language rights of ethnic minorities and fabricated information regarding self-immolation, etc. to incite separatist sentiments. A number of foreign diplomatic representatives based in Beijing traveled to Yushu to witness the hearing but they were not let in, according to the New York Times. About fifteen members of Tashi Wangchuk’s family also came to attend the trial after the Chinese authorities promised to let them in. However, only three relatives were allowed to attend the trial. Tashi Wangchuk was detained on 27 January 2016 after appearing in a New York Times video for minority language rights in China. He was formally charged with “inciting separatism” in March 2016 despite his stance that he doesn’t seek to separate Tibet from China. Before the trial went on this morning, CTA President Dr Lobsang Sangay has expressed his concern and urged Chinese authorities to uphold constitutional rights while pronouncing the sentence. “Tashi Wangchuk has on his own volition advocated for a constitutionally guaranteed right, that of bi-lingual education for Tibetans and ethnic minorities. His trial and sentencing will determine largely whether the Chinese Government is committed to upholding the internationally recognised laws and domestically accepted rule of law in China,” Dr Lobsang Sangay, President of the Central Tibetan Administration has said.